Many bicyclists seem to think that they have the right of way when faced with vehicular traffic situations. This is simply not true, and is often the reason bicyclists get hit by cars. Before you head out on a bicycle ride on any of the Hilton Head bike trails make sure you and your family know the rules of the road. Do not expect vehicles to stop for you even if you have the right of way. Be cautious crossing streets and use the pedestrian crossing light. If a vehicle is trying to pull out into traffic, and you need to ride in front of it, be sure to make eye contact with the driver so he/she knows you are there and what your intention is. When riding on a street always ride with traffic, not against it. Always use a bike path when one is available. Stay off the streets. When overtaking another cyclist or pedestrian always say “passing left/right” so they get out of the way. When crossing an intersection with your crossing light be aware of vehicles making a right turn with a red light. They are supposed to give you the right of way since you have the crossing light, but not all drivers are aware of this. If you are driving a vehicle, never stop and wave a cyclist on as this is likely to cause an accident. Wear a helmet. Although there is no helmet law on Hilton Head, it is advisable to wear one anyway for your own safety. Falls on the head can result in very serious injury. When riding on the beach stay out of the soft sand. It can cause the front wheel to suddenly pull right or left and cause a fall. We had this happen to one of customers once and she ended up breaking her ankle in 3 places. Now you know the rules of safety for bicyclists. Be sure your kids know them to. 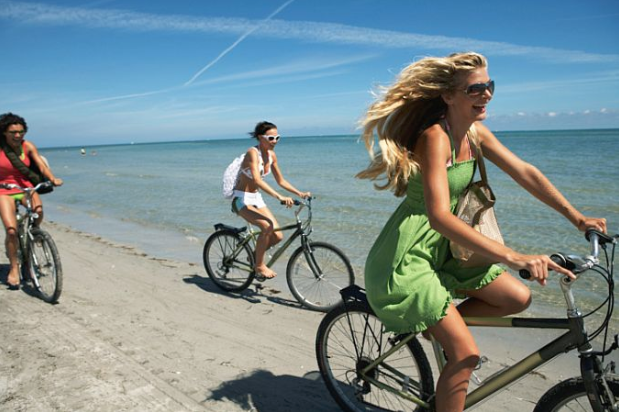 Enjoy bicycle rides on Hilton Head!